Decrypt is a small venue that opened recently, a fifteen-minute taxi journey from the centre of Prague. Usually, I’d stick to pretty central escape rooms unless they’ve got a stellar reputation, but The Red Room had one of the most quirky and endearing videos I’d ever come across. It tells the story of Mr Papercup, whose girlfriend, Ms Smallbag, has been abducted by the evil Mr Papercone. I kid you not. There’s so much more to it than that but, to do the story justice, you need to go and watch the video. Now. Go – you won’t regret it. I’ll wait. It’s easy enough to find the venue – just look for the ice cream shop (which must be pretty good given it was packed with locals in the depths of October! ), and you should see a small sign next door that leads the way. Descending into the basement, that quirkiness starts to reappear with the decorations and directions that lead you to the reception of this pretty venue. A few minutes later, we were inside the game. “Wait. You seem to have accidentally put us into the wrong room. This is definitely not the game from the website!”. I have seldom been more surprised by a start to a game, and this definitely didn’t feel surprising in a good way. We entered a space and had absolutely no idea what to do. Or even where to start. No clues, nothing to interact with, just blank walls. We wandered aimlessly around the space, wondering how to continue. And then we saw something. And again. Each time we were at our wits’ end, we’d spot one little thing that encouraged us to keep going. Just enough to keep our hope alive. And then the game started to improve. In fact, it started to impress. We saw the quirkiness that had drawn me to the game in the first place and how the story from the video came to the fore in an incredibly endearing way. This experience is pretty minimalist but, when they do create something with which you need to interact, they create it beautifully and, just as much as I’d been in despair about what to do when we started, I was engaged by what we had to do for the rest of the game. There’s one hiccup during that phase: a puzzle that’s a combination of tedious searching/observation and maths. Fortunately, I managed to almost entirely miss that section, but it really didn’t look like fun. The rest of what we had to do was pretty cool, though, solving puzzles that required physical interaction with the set and were well fitted to the theme. There were even a couple of moments of theatre thrown in. By the time we escaped after around 45 minutes (and, annoyingly, taking a single clue on something we should have spotted), this game had me hooked. It was quirky, it was clever and it was endearing. 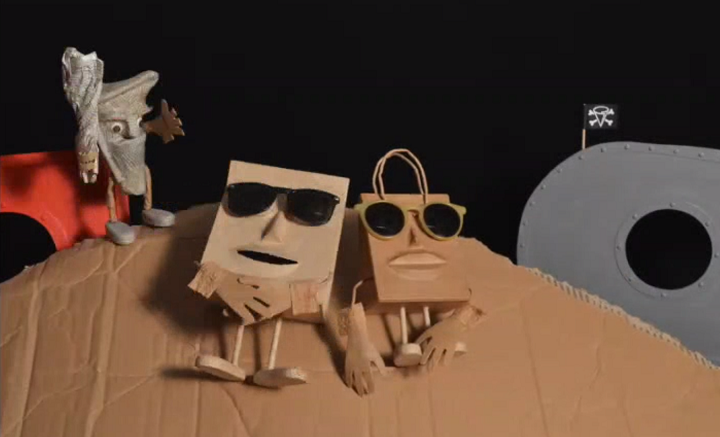 Plus, it finished exactly the way it should: with us helping Mr Paperbag on his quest to find Ms Smallbag. The Red Room is a fun experience, but it isn’t close to being the best in Prague. If you’re only going to do one room, then there are better choices (Galactic Pioneer, Poltergeist or Mission 53 all spring to mind), but this one is still fun and it is very, very different from the majority. Sufficiently so that I encourage enthusiasts who are looking to play a few games in the city to head along to it – it’s not often you’ll see a game that’s so different from the rest. That’s all on Decrypt – want to read more about other local games? A link will be added here when the summary article is published at the end.